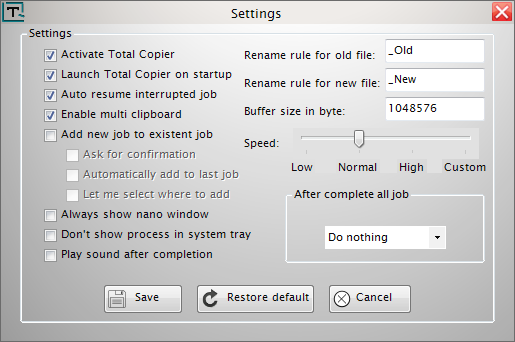 Total Copier is a free data copier software for windows. It optimizes the file transfer process and gives you super fast file transfer speed. It is free to use and activation process is also free. Total Copier allows you to resume an incomplete copy or move task without pressing any key. And it is also comes with Multi-Clipboard feature. Using this Multi-Clipboard feature, you can work on maximum 9 different clipboard at the same time. You can also add files to the Pending list in Total Copier. 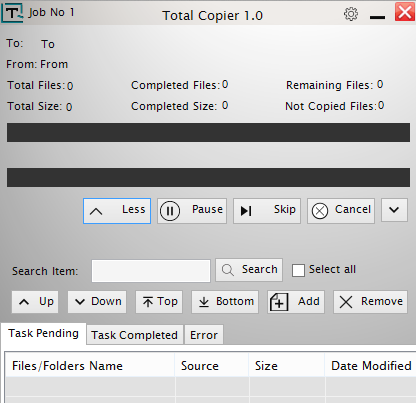 You can download Total Copier from the below download link. The downloaded file file size is arounf 1MB. Just extract the zip file and install it via the installer. It comes with a simple user interface. It also keeps record of all your copy and move operations. In the settings window you can manage the buffer size and you computer’s power management options like Hibernate, Shutdown or Sleep. Some other features are advanced error log,short key support, advanced files collision management with custom rename rules and windows shell integration support.